Every artist seems to have a collection of old picture frames tucked around the studio: some damaged, some out of fashion, some casualties of change in personal taste. The goal of every painter is to find an economical, good quality, and efficient system to frame paintings. Here I offer helpful tips—the result of lessons learned the hard way. 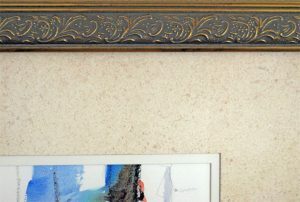 Although there are many elegant frames and even triple layered custom shaped mats available, always remember that the painting is the star of the show, and should be enhanced rather than overpowered by the framing. You want the viewer to look at the painting, rather than focus on the mat and frame. 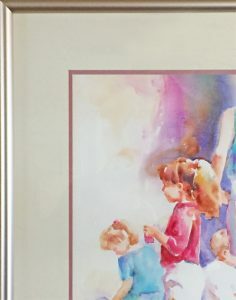 The traditional watercolor presentation incorporates a wide, often off-white or neutral colored mat, usually about 2 inches wide on small paintings and increasing up to 4 inches wide on larger pieces. This often includes a narrow inner liner (double mat) about 1/8 to 1/4 inch wide. The liner can be a more aggressive accent color—often a color repeated in the painting. The frame itself is generally much narrower than the mat, about 3/4 to 2 inches wide. 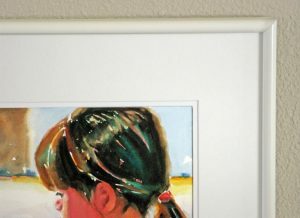 A second popular and contemporary matting choice is to "float" the painting. In this method, the painting is simply attached to the top of a flat sheet of mat board, rather than being placed beneath a cut mat opening. Note that this method requires a spacer inserted between mat and glass (or plexiglass) so that the watercolor paper does not press against the glass. That way if humidity condenses inside, it won't come in contact with the painting. It is very important that the mat and backing are acid-free or archival. I use acid-free foam core board for backing and gummed linen tape to attach the painting. Many a painting has been ruined by "acid burn" which yellows the watercolor paper with time. Two of the worst culprits for creating acid burn are brown corrugated cardboard used as backing and masking tape—beware. Note that watercolors are a handmade art form, and they often have a gentle wave in the paper. This is normal. It is not desirable to dry mount or otherwise glue the painting to a flat surface, as this can degrade the value of the artwork. Where is the painting going to be displayed? The answer to this question determines many framing choices. If a you know the painting's exact destination, such as your living room wall, then you can be more aggressive with mat colors, and perhaps spend more money on custom framing to match your decor. Also, you may choose real glass which is more fragile, but easier to keep clean than the easily scratched surface of plexiglass or acrylic glazing. There are now a number of high-tech glass choices, including glass with glare reduction and UV blockers. If the painting is going to be displayed in a gallery, then it is good to preview the gallery ahead of time. Do they allow glass or require acrylic plexiglass? 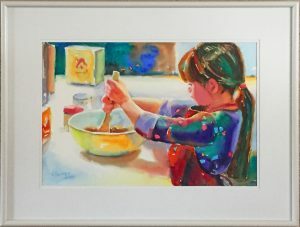 What is the overall quality of existing gallery framing? Often there will be a mixture of traditional gold leaf wood and more contemporary frames? Are there issues with glare from windows and spotlights? 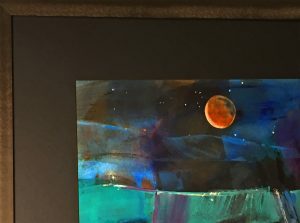 If a painting is going in a gallery, then mat and frame colors need to be more generic. When you choose a foam green mat, and it doesn't match the buyer's sofa, then you have lost a potential sale. Also note, it is good to offer a small framing allowance to buyers who love your painting, but don't care for the framing. You can always re-use the framing on another painting. If the painting is going to be entered in competitions or moved to various locations, then acrylic or plexiglass glazing is a must, to avoid breakage. Many competitions specify white, or off-white matting. Expect minor damage, such as scratches in plexiglass or on the frame surface. If scratches are small, often the frame can still be used "as is" in another competition. I prefer metal sectional frames, purchased in pairs. For example a 16x20 frame would require one pair 16 inches in length and one pair 20 inches in length. These come with the required hardware, are easy to assemble, and are available in a good variety of profiles and finishes from a number of vendors. Sectional frames are also now available in traditional wood finishes. Most vendors will pre-assemble the wood frame for a small fee—well worth the extra cost. Following are links to several internet sources of framing. 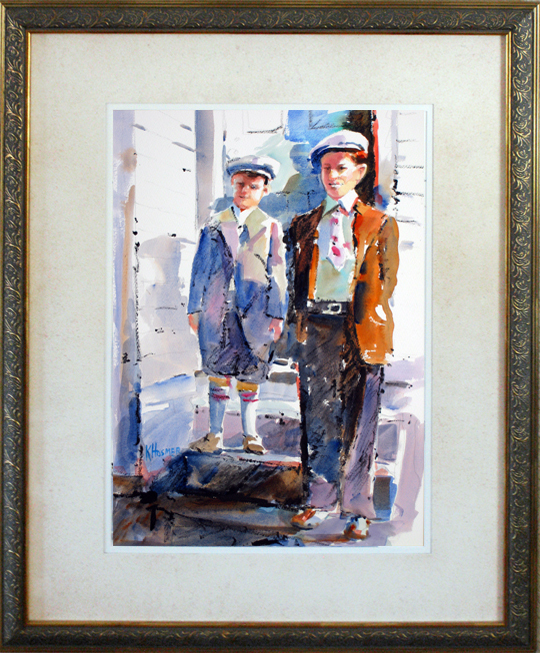 Both vendors below offer Nielsen brand frames—a high quality standard in metal framing.